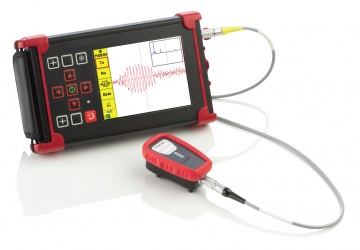 Designed for NDE on Aerospace specific applications, the EtherCheck offers the very best in Eddy Current and Bond Testing performance in a compact, rugged and lightweight package. Configurable Full Screen, Single, Dual Spot or Dual Pane with variable size and location and function e.g. XY, Timebase, Waterfall and Meter. Display Modes Spot, Time base (0.1-20 seconds x 1-200 sweeps and up to 55 seconds), Waterfall and Meter with peak hold and % readout. Shots Comprehensive Record Replay and Storage. Running Time Up to 8 hours with a 2MHz Pencil Probe 30% Back Light and up to 6 hours with a Rotary Drive at 3000rpm 50% duty cycle.